The gig will be streamed on YouTube from the Plaza de Toros de Las Ventas on October 26. The date, part of the ongoing online series American Express Unstaged, takes place two days after Coldplay release new album Mylo Xyloto. "Until we can come to a video as good as Single Ladies by Beyonce, we have to rely on just the meat and vegetables of playing songs live," Coldplay frontman Chris Martin said from Cape Town, where the band played on Wednesday. "And this is just a nice way of doing it for a few more people at once." Unstaged has frequently paired acts such as Arcade Fire, John Legend and My Morning Jacket with famous directors. The Coldplay concert will be directed by Anton Corbijn, the photographer, music-video maker and filmmaker of Control and The American. 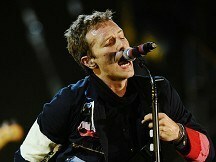 Anton has directed several Coldplay videos but has one quibble with the planned concert. "I don't particularly like lasers," he said. "At the moment, I've given into two songs." Chris added: "He'll win, of course. He's much better at the visual stuff." Coldplay are currently playing a handful of festivals, but famed bullfighting location Las Ventas is a unique location. "Even if you just look through one camera, it's going to look great," Anton said. "The arena is so beautiful." But Chris and Anton don't consider themselves bullfighting fans. Anton explained: "I'm a Taurus myself, so I feel sorry for the bulls."